Study the individual company catalogues and if possible buy from a supplier with a good reputation within the research community. The number of monoclonal generated as research tools by both industry and the research community has exponentially increased. At present, ≈320 companies produce or sell >350,000 antibodies for research and clinical markets (www.antibodyresource.com/onlinecomp.html). Although this wealth of reagents has exciting scientific potential, it is important to remember that a substantial number (around 40%) of monoclonals would fail even in the most fundamental tests of activity or specificity. A recent analysis from Frost & Sullivan's (Strategic Analysis of the U.S. Research Antibodies Market) identified the most common suppliers of research antibodies within the USA and also the 15 antibody suppliers with the best reputation for antibody quality as determined by the research community. When trying to source an antibody there is less risk when purchasing from a supplier with a good record of customer satisfaction. 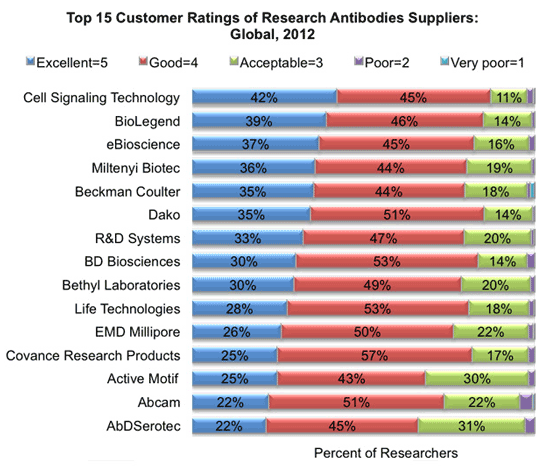 Figure legend Top 15 Customer Ratings of Research Antibodies Suppliers: Global, 2012. The strategic Analysis of the U.S. Research Antibodies Market survey determined customer ratings of suppliers, supplier usage, unmet needs, and challenges. This survey was done gathering satisfaction information of customers from academic institutions, federal and state government laboratories, pharmaceutical, biotechnology and diagnostic companies, hospital and clinical laboratories, and private non-profit organizations globally. Cell Signaling Technology, BioLegend and eBioscience were the three most highly-rated companies based on the quality of the product sold.